In 2011, the National Highway Traffic Safety Administration (NHTSA) established new uniform criteria for observational surveys of seat belt use across the U.S. The results of the latest survey reveal trends in seat belt use specific to our state. Below, the personal injury attorneys at the DeMayo Law Offices highlight survey results from 2017, review North Carolina’s seat belt law, and show instances when seat belts cause harm instead of preventing it. North Carolina seat belt use rates have increased since 2009. In 2017, North Carolina drivers buckled up 91.6 percent of the time; passengers did so at about the same rate. Vans and pickup trucks had slightly lower seat belt use rates compared to cars and sport utility vehicles. Women tend to wear their seatbelts more often than men. And seat belt use among drivers younger than 25 was lower than all other age groups. In addition to seat belt use, the 2017 Seat Belt Use Survey also assessed statewide use of cell phones while driving. Survey observations concluded the rate of texting while driving in North Carolina increased from 3.2 percent in 2016 to 5.1 percent in 2017. Drivers and all passengers 16 and older must wear their seat belts. 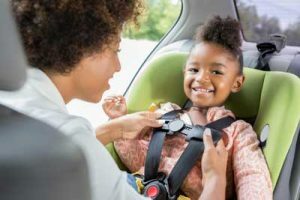 Children are covered by the North Carolina’s child passenger safety law, which requires children younger than 16 to be restrained in an age, weight, and height appropriate restraint. Child passenger safety laws apply to all vehicles required by federal standards to have seat belt assemblies. This includes all passenger cars manufactured after 1967 and most vans, pickups, and SUVs made after 1971. Seat belts, like airbags, save lives. But when seat belts are worn incorrectly or are poorly manufactured, they can cause serious injury. Chest or rib injury: Wearing a seatbelt incorrectly can injure your ribs and chest. For example, wearing it under your arm instead of over the shoulder can result in these types of injuries in the event of a crash. Traumatic brain injury (TBI): Wearing the shoulder strap behind the back or not having a shoulder strap at all can cause your head to strike the steering wheel or dashboard. Deep bruising: The car’s momentum stops almost immediately in a car accident. Your body, however, gets thrust into the strap. Bruising is one of the most common injuries resulting from car accidents. Shoulder injury: Because seatbelts stretch across the shoulder, shoulder injuries (e.g., rips and tears to tendons and ligaments, rotator cuff tears, and bone fractures) are common. Seat belt defects are also a concern. Defects can be due to errors in design, manufacturing, or assembly. Seat belt defects often include false latching or buckle failure, internal unlatching, and retractor issues. When seat belt defects are present during an accident, injuries are often exacerbated and sometimes fatal. People who suffer injury from a defective seat belt have the legal right to claim financial compensation for their injury and losses. This is accomplished with a seat belt defect lawsuit and a defective product lawyer. Get the information you need to live a safe and happy life. Find the DeMayo Law Offices on Twitter, Facebook, YouTube, or Linkedin. How Does North Carolina’s Contributory Negligence Work?